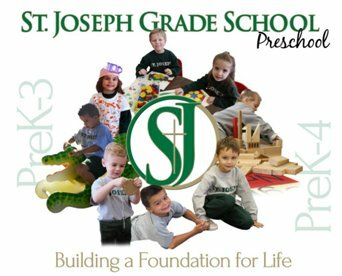 A place filled with adventure and creativity, St. Joseph Grade School’s PreK-3 & 4 offers full day programs. Here our youngest students are encouraged to explore and discover in a loving and nurturing environment where play is a natural part of learning. Our PreK-4 program utilized the “Super Kids” reading curriculum. Children flourish at their own pace as they build their language, math and social skills to prepare for Kindergarten. Fueled by faith, our passionate teachers guide each child on a personal journey to become closer to Jesus and to embrace our Roman Catholic Faith. As a community we pray together, we teach by example and we strive to go far beyond the classroom. The foundation starts here!